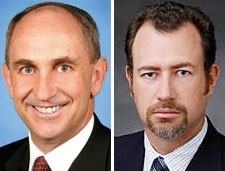 GM CFO Chris Liddell, left, will be replaced April 1 by Dan Ammann, who is currently GM's treasurer. General Motors Chief Financial Officer Chris Liddell will leave GM on April 1, the automaker said today. The unexpected departure follows GM's record-breaking initial public offering in November. Liddell, 52, joined GM in January 2010 from Microsoft Corp. He will be succeeded by Dan Ammann, 38, GM's treasurer. Both Liddell and Ammann are New Zealand natives. Ammann became GM's vice president for finance and treasurer in April 2010. He leads the GM Treasurer's Office in New York City. Before joining GM, he was managing director and head of industrial investment banking for Morgan Stanley, a position he held since 2004. Prior to that he spent spent five years at Credit Suisse in New York and his home country of New Zealand. "Chris was a major contributor during a pivotal time in the company's history," GM CEO Dan Akerson said in a statement. "He guided the company's IPO process and established a good financial foundation for the future." Last November, GM sold more than $20 billion in common and preferred stock in an IPO. GM, in the statement, said Ammann has played a "major role in the key financial decisions at the new GM." He has been involved in setting financial strategy and reducing debt, along with the IPO process. "Dan's depth of knowledge of the financial community and our business will be instrumental as we continue to earn the trust of global investors and customers," Akerson said in the statement. "He is held in high regard on Wall Street and within the company and, as we move our financial strategy forward, his credibility and leadership will be invaluable." Said Ammann: "Chris and I have worked together very closely during this time and I am committed to a seamless transition and to building on what we started."